French President Emmanuel Macron, currently still in New York for the United Nation’s annual General Assembly, claims to not care about popularity polls. However, his many young voters from last year seem to think otherwise as they are abandoning him in ever larger droves. Sixteen months after he was swept into the Elysée Palace at the head of the centrist En Marche political party in a runoff against rightwing Marine Le Pen, his ratings in the opinion polls continue to plunge. By now, only some 28 percent of his compatriots support him, less than his predecessor Mr. François Hollande of the leftwing Socialists at this point of his presidency. Although political analysts agree that the former Rothschild banker has been able to reform France already more than his two predecessors, Nicolas Sarkozy and François Hollande, both of them were at this stage in their terms faring better in the opinion polls. Related coverage: <a href="http://thegoldwater.com/news/37919-Brexit-President-Macron-Threatens-To-Boycott-Signing-Meeting-Unless-UK-PM-May-Yields"> Brexit - President Macron Threatens To Boycott Signing Meeting Unless UK PM May Yields</a>. Mr. Macron is indeed in the process of reforming the French business landscape. Under his leadership, companies are shaking up the tax system, shrinking the government’s imprint on the economy and shifting the burden of taxation away from private economic activity. The problem is that he can’t seem to lend a helping hand to the younger French population who remain stuck with one of the highest unemployment ratings of all developed European economies. Part of his problem, according to the French interviewed by pollsters, is his personal style. He is increasingly seen at home as an imperious intellectual who does not care for the ‘man in the street’. His handling of an unemployed gardener recently whom he told to ‘just cross the street’ and get a job as a waiter was not received very well. There are further worrying signs. 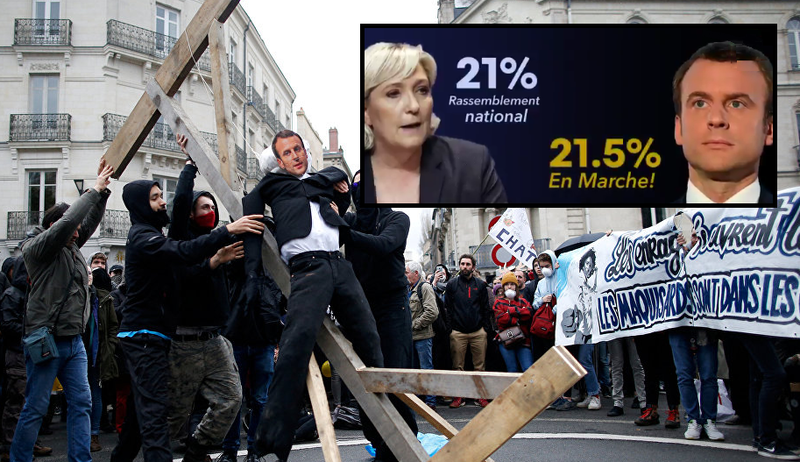 At a recent protest rally in Nantes, where 9 out of 10 voters cast their ballot in his favor last year, an effigy of him was burned by youngsters. Lastly, recent opinion polls have shown that the only one truly benefitting from this discontent with Mr. Macron is his eternal foe on the right, Ms. Marine Le Pen, who after restyling her party from Front National to the much softer and more centrist aimed Rassemblement National can sit back, relax and watch angry voters flock to her.